Google for Work’s Inside Sales Team decided to pilot a new program where Online Sales Reps managed all inbound Latin American SMB leads ranging from 1-100 employees. The majority of companies in Latin America are SMB’s, so managing all of Spanish-Speaking Latin American companies required a team that could understand the climate of every country. This role expanded my understanding of how much political, economic, and even climate changes can be a devastating factors for business owners in developing countries. Business conversations for Latin American sales required an immense sense of compassion, and I understood that being born in Colombia- I was speaking to people who didn’t understand the internet speed that I lived in. In order to close a sale with these customers, I mastered the art of understanding and putting myself in these small business owner’s shoes. Expensing USD $10 a month for every employee’s emails was 3 times as much when converted to their currency! To succeed here, I had to change my tactics. Selling them a Google Solution was not just a novel technological product, it was the peace of mind that in the case of any national or economic crisis, their company’s information was safe. Their passwords, their grandmother’s recipe, and even the phone contacts they managed. 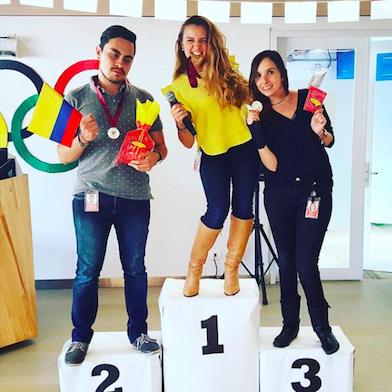 I reached 200% success on the LATAM Online Sales team. My sales generated a monthly $25,000 pipeline to over 100 weekly prospects in Argentina, Chile, Bolivia, Peru and Ecuador. As a 20% project, I was heavily involved with Google's Hispanic Organization of Latin Americans (HOLA). I helped to host the US Hispanic Chamber of Commerce at Google Tech Corners with Adrianna Samaniego, the Diversity Markets Program Manager. I assisted Eliana Murillo, Google'S Multicultural Head of Marketing, in hosting the Latino Community Foundation at Google's SF office to promote Hispanic philanthropy, inspire social change, and educate Latinos about voting in the 2016 election.